Because a Promise is a Promise! Several weeks ago I made an announcement that once my OneGreenTomato Facebook page reached 300 fans I would hold a giveaway; 307 fans later and I am ready to make good on that promise! I am a girl with many interests, three of them I am very passionate about: growing food (big surprise there), photography, and sewing. The latter of the three is what I’m offering up as the prize! 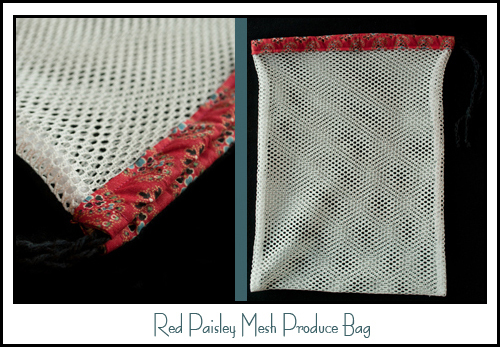 In April of 2011, I started making reusable mesh produce bags. I mean seriously, who doesn’t want to reduce the amount of single-use plastic blowing around and still look good while doing it? Well, I recently restocked those virtual shop shelves and decided to offer up a medium-sized mesh bag as a giveaway prize! My produce bags are constructed from a durable light-weight, utility mesh and feature a stylish fabric casing with a hand-crocheted drawstring closure. They come in small, medium, and large sizes and are available in sets of three! One lucky reader/fan will win the bag shown in the picture below! Mandatory Entry, leave a comment on this post letting me know what delicious produce you would fill your bag with should you win! Friend Pixy Patch on Facebook, and repost this on your Facebook page, then comment letting me know you did so. Sign up to follow Twisted Threads, then leave a comment stating you did so. If you are already a subscriber, just comment letting me know. 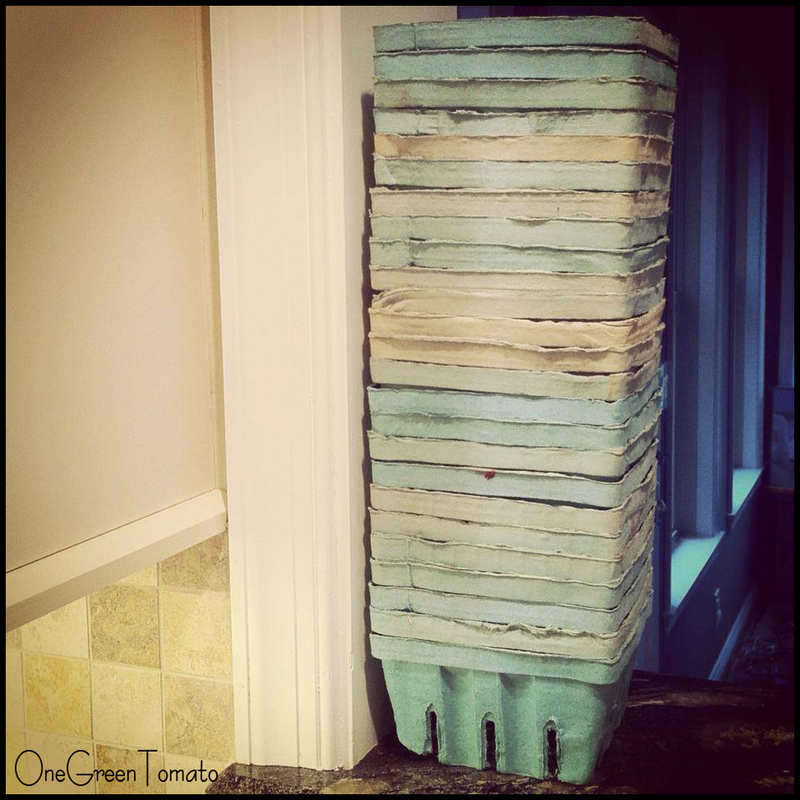 Sign up to receive email notices when new blog posts on OneGreenTomato are available, then comment letting me know you did so. Friend OneGreenTomato on Facebook, then comment letting me know you did so. Retweet this post, leave a comment including your Twitter id. Reblog this post, leave a comment letting me know you did so. Okay, that’s a total of 7 chances to win! Just make sure you leave a separate comment for each of the different entries! 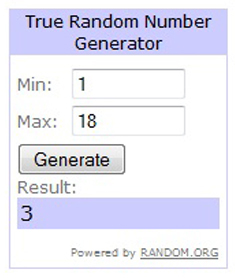 The winner will be chosen, at random, on Tuesday June 25th! Good Luck and Happy Summer Solstice! Two weeks ago I ventured across the river to my friend’s farm. There, I spent my Sunday morning alone in the quiet fields picking the essence of Summer: sun-ripened, perfectly sweetened strawberries. Last Sunday I did the exact same thing. In total my efforts yielded 50 quarts, which translated into hours and hours of washing, hulling, and preserving Summer’s most sought after fruit! In preparation for the harvest I was planning on bringing home, I started formulating my plan of action. I had already decided that half of my fruitage would end up frozen to be enjoyed in the off-season, and there was definitely going to be a lot of shortcake baking taking place, which eliminated several more quarts. Now, what to do with the rest? 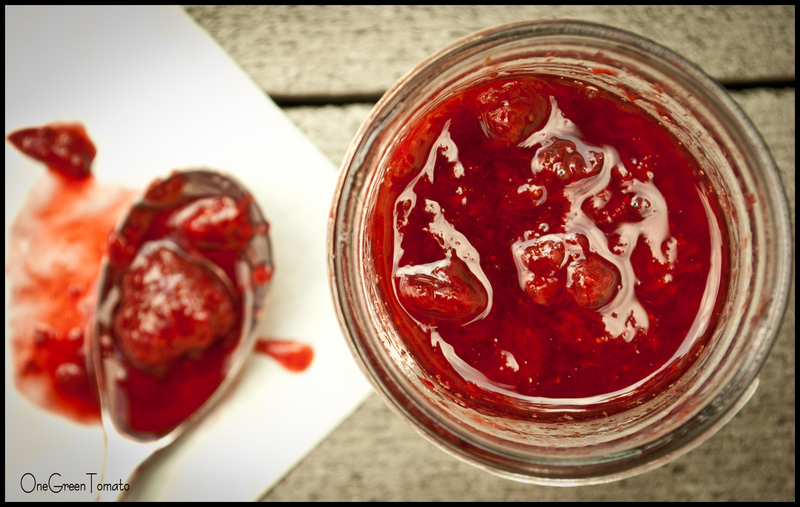 After flipping through my collection of food preservation books, I finally narrowed it down to three mouth-watering recipes. 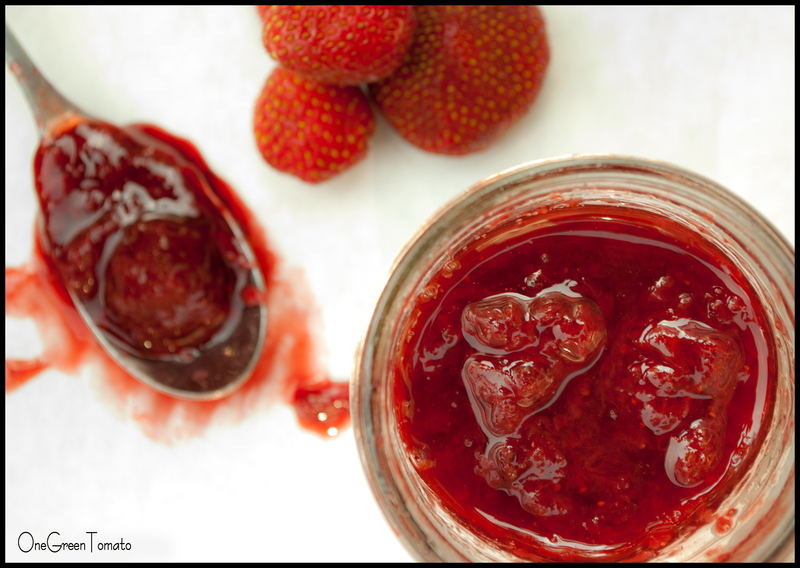 First up: strawberry orange compote. Oh yes! In a large pot combine strawberries, sugar, orange and lemon juices and their zest; bring to a simmer over med-high heat, stirring often. Lower the heat to a minimum and gently simmer for 30-45 minutes, stirring frequently to prevent scorching. You will end up with a slightly reduced, but still runny mixture. 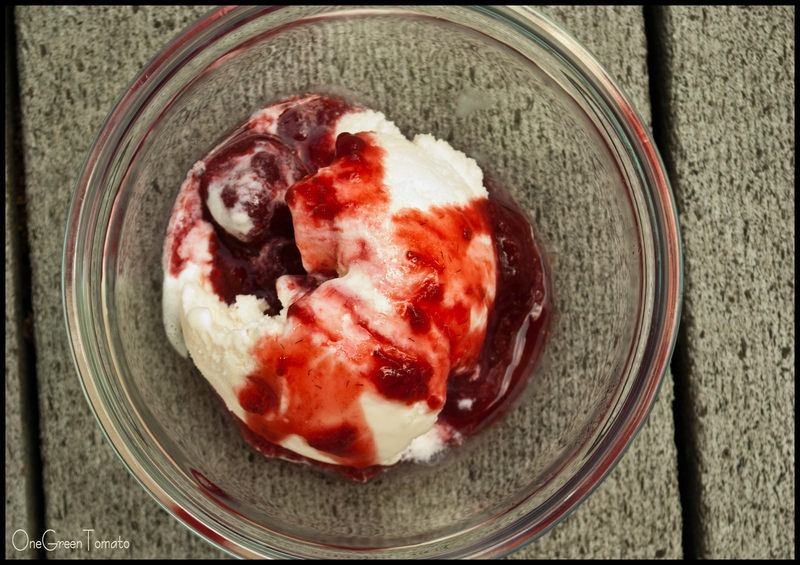 Ladle into hot, sterilized jars leaving 1/4″ headspace; remove air bubbles, wipe rims, and adjust two-piece lids to fingertip-tight. Process in a boiling-water bath for 10 minutes, adjust for elevation. So far my favorite way to enjoy this slightly sweetened sauce is drizzled over a bowl of creamy vanilla bean ice cream. Absolute heaven if you ask me! I also canned a batch where I excluded the zest, therefore reducing the pectin content, which resulted in a slightly looser, but equally delicious sauce. Images and content copyright © 2013 Danielle R Limoge. Recipe adapted from Tart and Sweet – 101 canning and pickling recipes for the modern kitchen by Kelly Geary and Jessie Knadler.